A great dinner for all the family and it's fast and easy to make too! Preheat the oven to 220˚C - 425°F. Drizzle the olive oil in a medium saucepan over medium heat. Add onion and garlic and cook until softened, about 3 minutes. Stir in the spices, sesame seeds, and almonds and roast, stirring, until fragrant, about 1 minute. Stir in tomato sauce, chicken stock, and chocolate chips. Reduce the heat to low and simmer, stirring often, for 5 -8 minutes until the sauce thickens and darkens slightly. Remove from the heat and add 200ml of water to loosen. Blitz the mixture at this stage if desired for a smoother texture. Meanwhile, cook the rice as per pack instruction. Add some coriander when cooked. When the rice is nearly cooked, Pour 4 tbsp of the mole sauce in a bowl add the chicken and combine until coated. Place the chicken on a baking tray in the preheated oven for 8 -12 minutes until cook through. Remove from the oven, serve the chicken, sliced with some coriander flavoured rice. 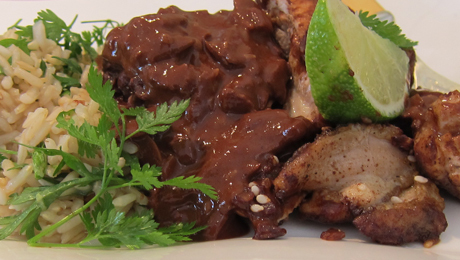 Serve with remaining mole sauce and lime wedges.